Piega TMicro 40 AMT review | What Hi-Fi? It may appear Piega’s TMicro 40 AMTs are facing an uphill battle. Our current favourites at this level are Revel’s award-winning Concerta2 M16 and the still-excellent KEF LS50s and, to be blunt, both sound better. But we feel the Piegas have a worthwhile place in the market. Why, you may ask? They’re small. No, make that tiny. These two-ways are about the height of a paperback and will happily fit into places and positions neither of our favourites will work in. They’re also beautifully made, with an aluminium cabinet (curved, to minimise internal standing waves) finished in one of three options: silver, black or white. The black and whites finishes are the premium choices - add £50 to the price we’re quoting. The combination of metal and the small size mean these speakers feel immensely strong - and the quality of the finish is lovely. While they look tiny for their price, a careful inspection confirms they’re built to Piega’s traditionally high standards. Look past the admirable aluminium box and you’ll find another one of the company’s signature technologies, namely a ribbon tweeter. This kind of drive unit, if done well, has a level of detail and agility dome-shaped alternatives find hard to match. Here it’s partnered with a 12cm mid/bass driver and fed from single-wire terminals. A small rear-firing port tunes the low frequency output of the mid/bass. While this means the speakers can’t be placed right up against a rear wall – the protruding rear terminals and speakers cable need a bit of space, too – a close-to-wall position remains preferable if you want anything resembling an even tonal balance. There’s nothing too unusual elsewhere, as far as specifications are concerned – the Piegas have a claimed sensitivity of 87dB/W/m and a nominal impedance of 4ohms. The frequency response is claimed to be 50Hz-40kHz, though without information on the variance limits the company has allowed. As usual, we give these speakers a few days of running in before we start to test. The sound doesn’t change massively in that period, but it does gain fluidity and a touch more clarity. Speakers at this level positively demand high-quality electronics, and these Piegas are no different. We use a Marantz CD6006 UK Edition with a Rega Brio along with our usual reference set-up of Naim NDS/555PS streamer and Gamut D3i/D200i pre/power combination. These speakers have the transparency to show up the sizeable difference in performance between the two pairings. Speakers smaller than your typical shoebox are never going to have floor-shaking bass or deliver any great sense of sonic authority. Some restrictions can’t be worked around. But within their limitations, these Piegas are rather sweet performers. They’re immensely detailed, revealing low-level details in complex music with ease. We listen to the Saving Private Ryan OST by John Williams and marvel at the way these speakers resolve so much information - and manage to organise it in such a cohesive and musical way. They describe a precise and wide soundstage too, positioning instruments with care and stability. Once positioned close to a rear wall these speakers manage to deliver a relatively even tonal balance, and have enough in the way of top-end refinement to cope well with harsh or aggressive recordings. Dynamics are handled with grace, without ever delivering the sheer reach of bigger rivals. We like the TMicro’s fluidity when dealing with both large and small-scale shifts, and their composure when pushed by difficult material or higher volume levels. Let’s be clear on this: these aren’t party speakers - but they do well for their dimensions. We move onto Beyoncé’s Lemonade set and the Piegas take it in their stride. The two drive units are beautifully integrated, delivering a seamless and articulate midrange. Beyoncé’s voice comes through brimming with power and emotion, while the jaunty rhythm track on Sorry is delivered with appealing composure. In absolute terms there’s a small shortfall of drive, and a little rounding off of attack, but the overall results remain entertaining and highly listenable. 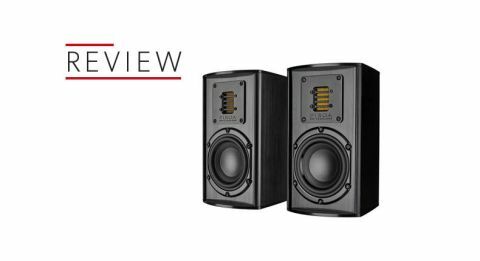 If you simply can’t accommodate conventionally sized standmounters but still want the insight of a good premium speaker, your choices are limited. The TMicro’s need to be on your (no pun intended) shortlist. In every area of performance not directly related to physicality - detail resolution, clarity and refinement to name but three - these speakers are right up there with the leading speakers in the class. For the right person, they’re a great solution.